Computer science professor Jennifer Burg blends music and visual arts. Computer science professor Jennifer Burg, whose research interests include music theory and digital production of sound, works in her office at WFU's Manchester Hall. Jennifer Burg embodies the spirit of a multidisciplinary scholar’s approach to teaching. She’s grounded in the humanities, with master’s degrees in both French and English underpinning a doctorate in computer science. 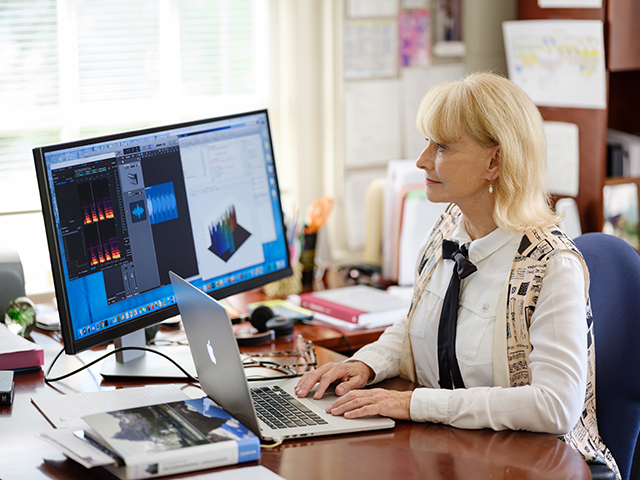 As a professor in the Department of Computer Science, Burg has applied her wide-ranging interests to her classes, merging computer programming with music and visual arts. She teaches students, for example, to understand the programming behind Photoshop color indexing so they can write their own programs to work magic on photographs. She has created a class in which she teaches the mathematical physics of sound and how to create sound digitally, and a friend and colleague in New Mexico joins the class remotely to talk about music theory. Wake Forest Magazine sat down with Burg to learn how she came to this confluence of language, arts and computer science. The conversation has been edited for length and clarity. Computer science professor Jennifer Burg created this illustration for one of her textbooks. 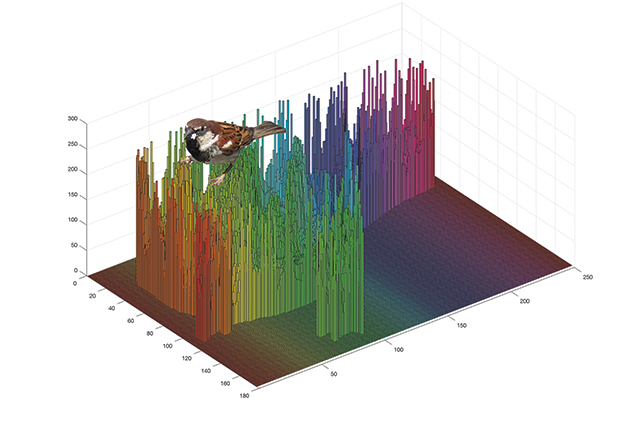 It shows a graph of the grayscale values of the pixels that would be used to create a digital picture of the sparrow. What drew you to French? Did you visit France? I didn’t until later in life. I was afraid to go away from home, but I had (French classes) ever since the seventh grade. … I had authentic French teachers — one was from Switzerland — so they were good. … I was the best student in the French class, and it was fun. I liked speaking French. I still speak French. … (And) I like studying literature. You taught high school and junior high school French after graduating with a bachelor’s degree in French from Elizabethtown College in your hometown in Pennsylvania. What led you to teach in higher education? My first job was teaching at a private high school in Leesburg (Florida). Then I taught in a public junior high school … in Hershey, Pennsylvania, and the kids were a fairly easy crowd, but, still, they were junior high school students. I got my master’s degree in French at the University of Florida. … Then I didn’t want to teach in a high school anymore … so I went back and got a master’s in English at the University of Florida. I got a job teaching English and French at Lake Sumter Community College in Leesburg, Florida. I did that for about nine or 10 years. What prompted the switch to computer science? Somewhere along the way I started getting itchy to have a Ph.D. I really wanted to teach in a four-year school. I did some research and, at that time, in 1983, they were saying the most valuable Ph.D. was in computer science. I had higher SAT scores on my math than my English, so I thought, “Let’s take the programming course in BASIC at the community college,” and I immediately loved programming. What did you love about programming? I like formal logic. It was just so pure. It’s the basis of all computer science. It’s also something that’s studied in philosophy courses. How did you develop your focus on art and music? I was trying to bring together things that are from different areas, like from graphics and from networks, and repackage them into what I called digital media … but not just showing the students how to use (photography and sound) application programs, telling them, showing them how those application programs were written. What kinds of things do students learn in your classes on visual arts? They can do algorithmic art, which is where you write a program that makes a picture, maybe a fractal-like picture, but you write an algorithm so that it’s creating that picture as you’re executing the program. That’s very creative. You have a Midi electronic keyboard in your office. Are you a musician? Why does music fascinate you so much? I took piano lessons for seven years, and I can read music, but I don’t play terribly well. The best book I’ve read in a long time is (Albert L. Blackwell’s) “The Sacred in Music.” He says there are two ways to appreciate what is beautiful about music. One is you just listen. … It’s just the beauty and the experience through your senses. This is the “incarnational aspect” of music. The other beauty is when you find out how it has a mathematical basis. To some minds, that’s beautiful. This is the Pythagorean appreciation of music through the intellect. If you want to think of it as God, it’s like God gave us these wonderful phenomena, vibrations, that we are able to perceive. … He handed that to us and said, “Whatcha gonna do with that?” It’s up to us, so we make music with that. What are some of the things you teach students about music? (In) a 100-level class, … it’s just exposing them to a whole lot of stuff. We don’t expect that they fully master it, but it’s amazing how much they can get just as quickly as we show it to them. We show them how they can use a program called MATLAB to generate individual frequencies. … They know how to create a note of a certain frequency … because really, a note saved in a computer is just a list of numbers. That’s all it is. … They’re learning what notes are, what the frequencies of notes are, what chords are, what intervals are, which ones sound harmonious and why. You are director of the STEM incubator, which offers hands-on experiences for non-computer science majors to explore science, technology, engineering and math. What’s the goal of those courses? It can help attract students, and it can also be gratifying to students who want to do more hands-on learning. Because some students are a little afraid of math or logic or programming … it breaks the ice with them for learning the math and the science. Talk about the project you did this summer with two students who created a course related to music of other cultures. (In the course they designed) students had a choice between two video clips that had Asian music in the background already, but they … were to create their own. … They select the key they want to compose in, select the beats per minute they want and then they could do it in a higher level (digital audio) tool. You can decide what instrument you want your clip to sound like, and it could sound like a violin or a piano or any instrument other than the one used originally for the clip. I envision that I could do a First Year Seminar in the music of different faiths and cultures where they don’t have to do these exercises, but I show them so they can grasp some of what’s going on without having to do it and they hear the different music. Doing this with different cultures and faiths, it’s just the whole thing of trying to bring people together. 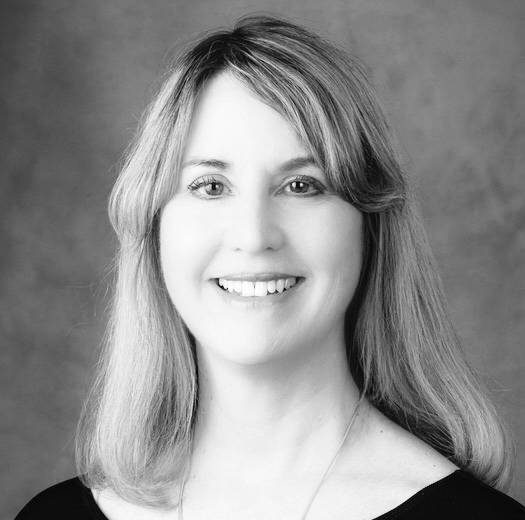 Carol L. Hanner joined Wake Forest Magazine as managing editor on March 1, 2018. Previously she edited books and wrote freelance stories for the magazine, following a 30-year career as a newspaper writer and editor.